This week marks our first year wedding anniversary. Around this time last year, the husband and I, along with our family and friends, all vacationed to Puerto Vallarta in celebration of our wedding. Our actual wedding anniversary is May 30th, but because we got married last year during Memorial Day weekend, this weekend feels more like the actual anniversary. I have friends mentioning it to me all week, how we can’t believe it has been a year since we were all enjoying ourselves in paradise. In celebration of those wonderful memories we created last year in Mexico, we wanted to look back and reminisce thru food…..thru the taste and flavors of Puerto Vallarta. 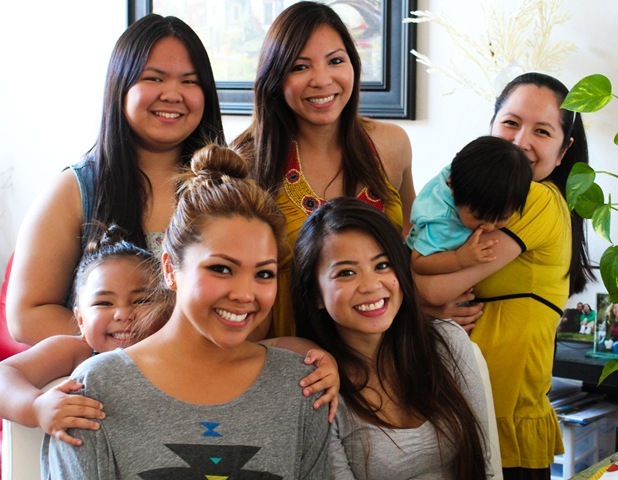 We had friends and family celebrate with us throughout the day. Even though we weren’t dining under the moonlight, with waves crashing behind us, I did my best in recreating the tropical ambiance with bright colors on our wedding day. These are the actual maracas used during our wedding. We gave them to all our guests and we took home a few extras. The candles helped set the mood. 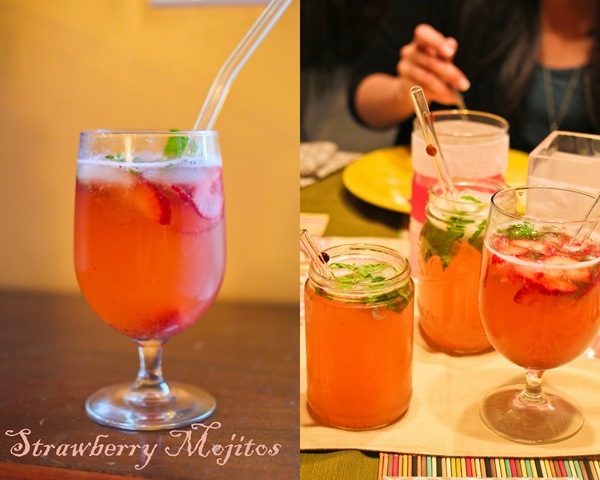 I made Strawberry Mojitos for our refreshing and sweet cocktail. We served the mojitos as soon as our guests arrived. One sip of this delicious drink and I was immediately transported to my favorite vacation spot, the tropics! 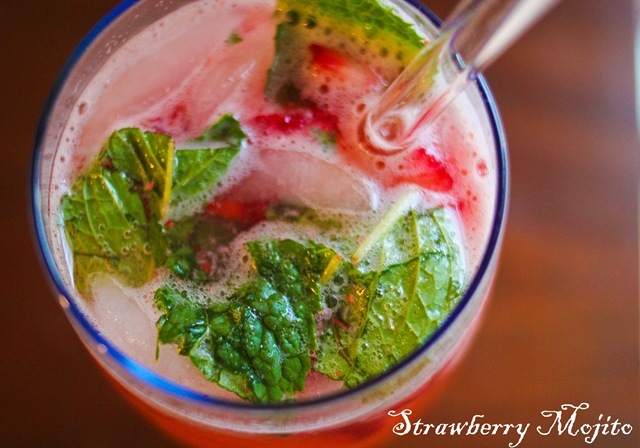 Combine the strawberry simple syrup, strawberry slices, and mint leaves in the bottom of a large glass and muddle with the back of a spoon. Squeeze in lime juice, add rum, ginger ale and stir. 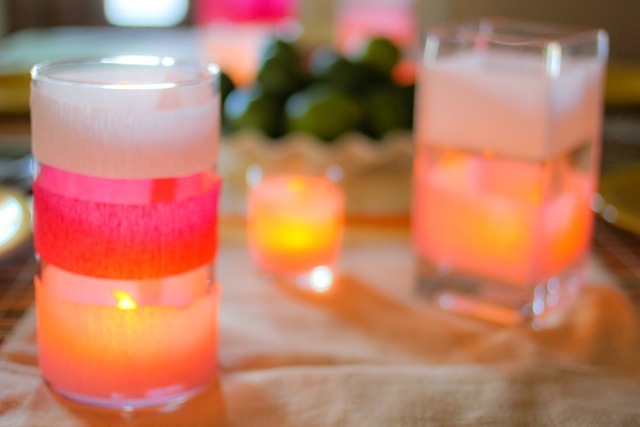 Fill the glass with ice, then top with club soda water and stir well. Pour the sugar, water, and strawberries in a small saucepan over high heat. Bring to a boil and cook for 1 minute, or until sugar has dissolved. Turn off the heat and allow syrup to cool. Transfer to a food processor or blender, process until smooth. Keep it in in the fridge until ready to serve. 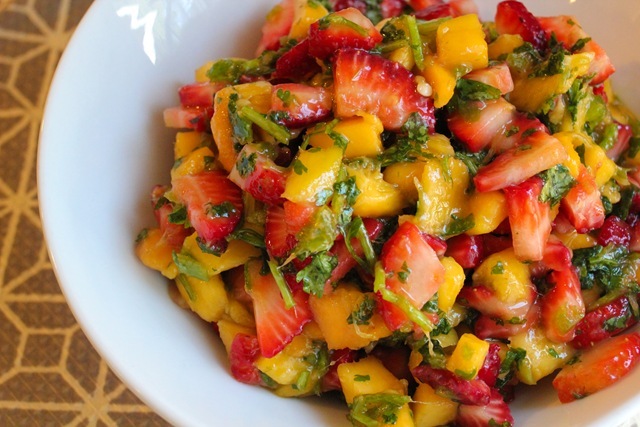 I got the idea of making fruit salsa from Mark Bittman’s video. I wanted to keep the tropical theme, so the fruits I used were mango and strawberries. All the fresh ingredients before it was all chopped. Look at all the colors. 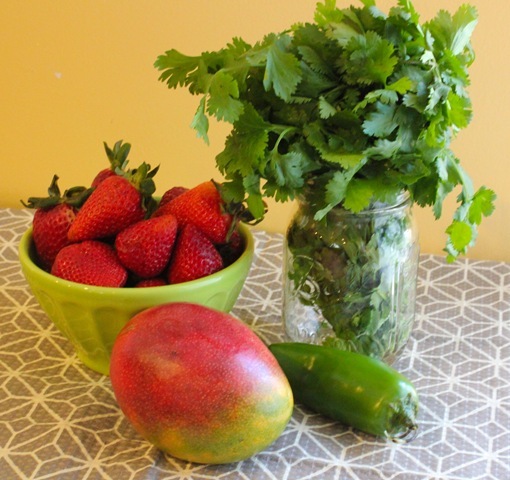 It’s very simple to make and it’s a great salsa for summer. 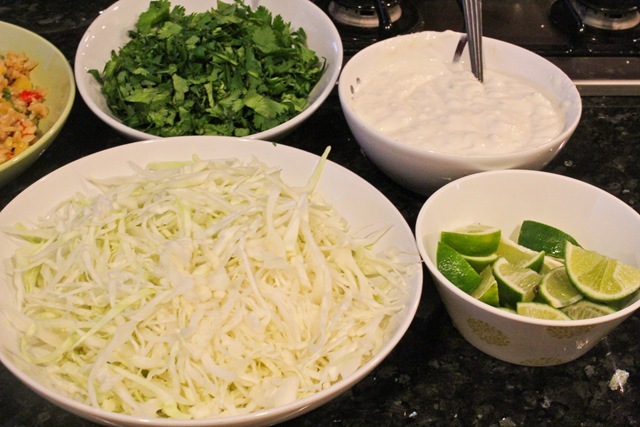 Mix all the ingredients together in a bowl and let it chill in the refrigerator for a few hours before serving. I used the salsa to top the Mexican Bites I made for appetizers. 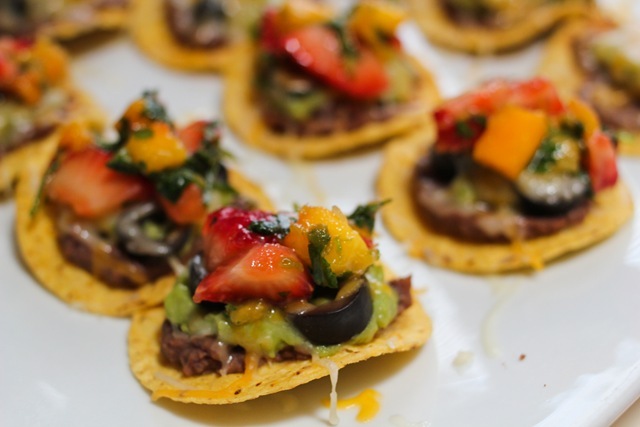 The Mexican bites were made of round corn chips, layered with beans, guacamole, olives and Mexican blend cheese. Place the chips in an oven-safe plate and bake in the oven at 300F for 5-6 minutes, or until the cheese have melted. 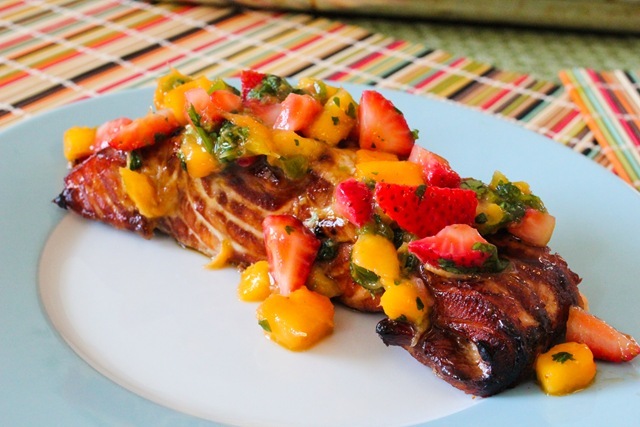 Topped with the fruit salsa (optional). We grilled a large fillet of salmon, seasoned with oil, salt and pepper. Then served each serving of fish with the salsa on top and lime slices. 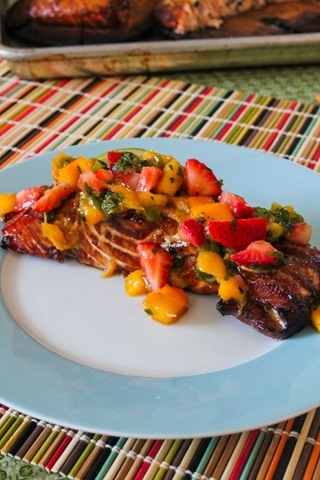 The naturally sweetened salsa complimented the grilled salmon so well. 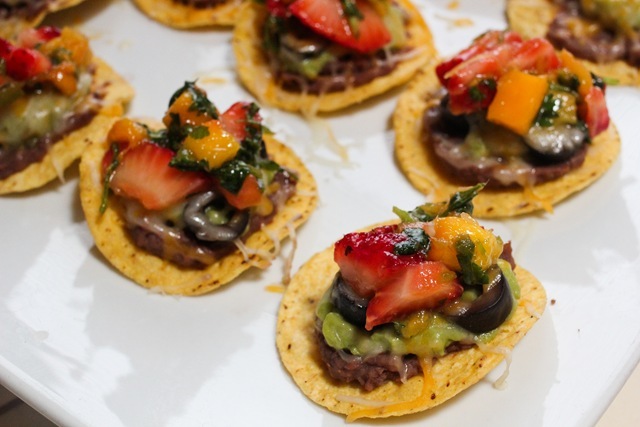 Each bite was just filled with fresh flavors, especially if you love cilantro (which I do), then you will like this flavor combination. 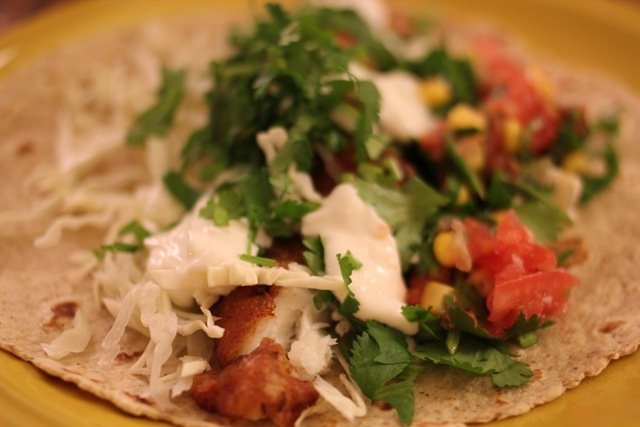 We created an assembly line to create fish tacos. 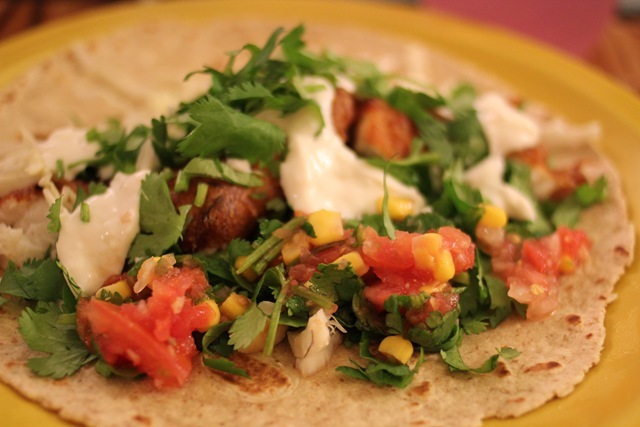 I made a fish taco burrito, and filled it up with all the fixins’, fresh salsa, cilantro and yogurt white sauce. We also had options for the meat lovers. 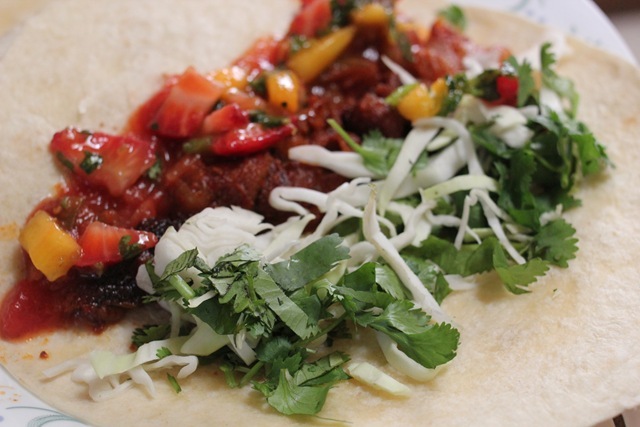 We grilled seasoned pork that were sliced paper thin and used it as a taco/burrito stuffing. 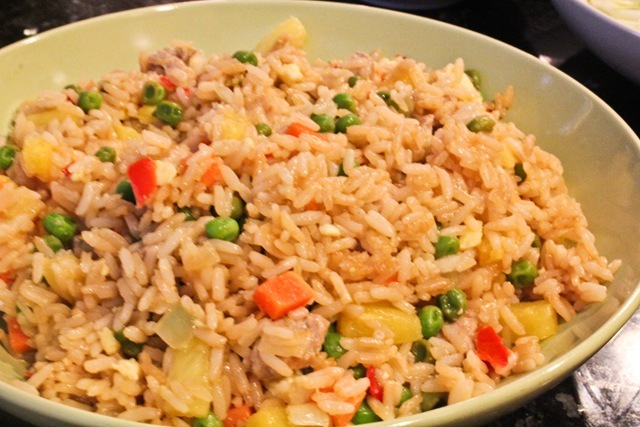 On the side, we had tropical pineapple chicken fried rice. Salty and sweet combination. During our time in Puerto Vallarta, I always gravitated towards the dessert table that had the churros. 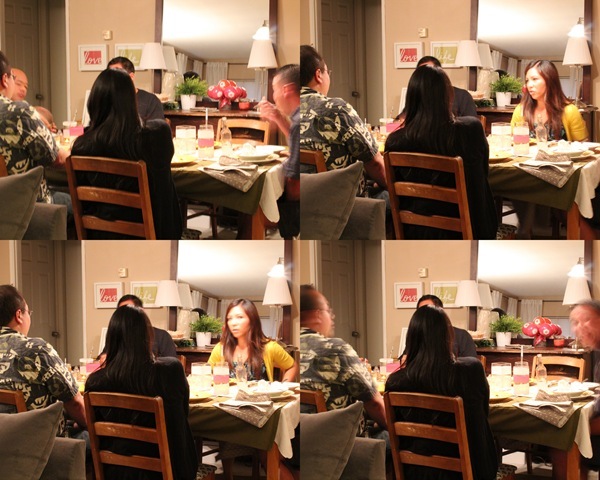 See evidence below, that’s a picture during our first night at Dreams Resort, filling up my plate with multiple churros. 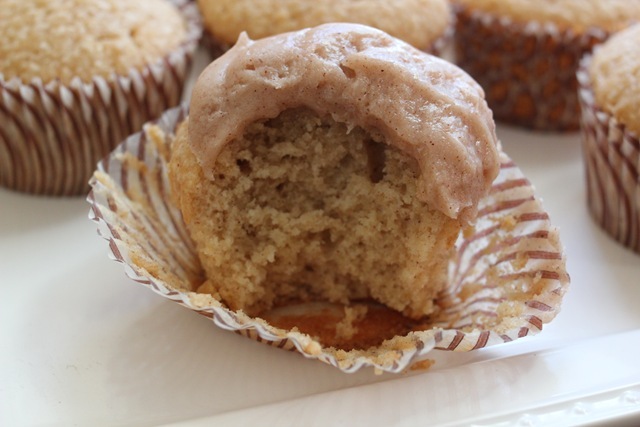 I made Churro Cupcakes. 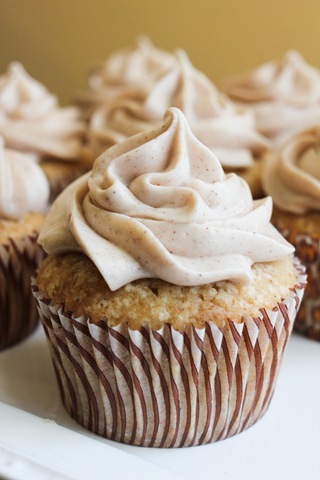 The same sugar and cinnamon flavor that I love in a churro, but packaged in a cake form with a twist of cinnamon cream cheese buttercream. 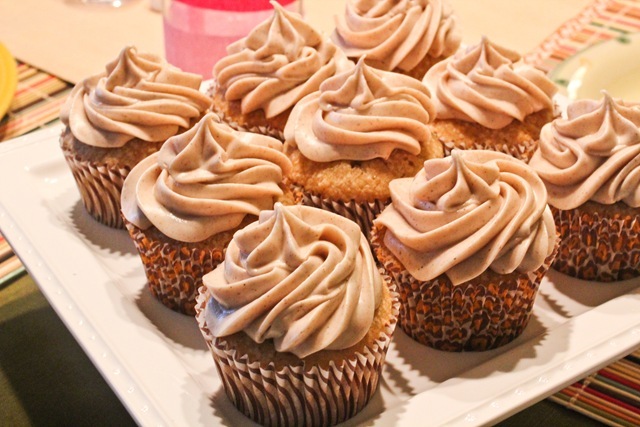 Everyone was excited to taste these churro cupcakes and it did not disappoint. Everyone loved them and one even commented that they taste like orchatas. 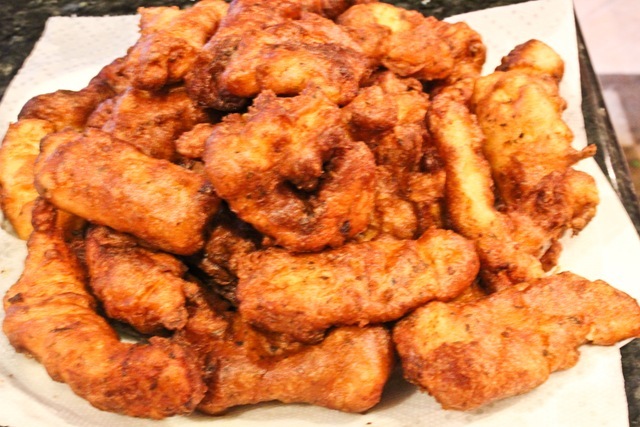 I will be posting the recipe soon. 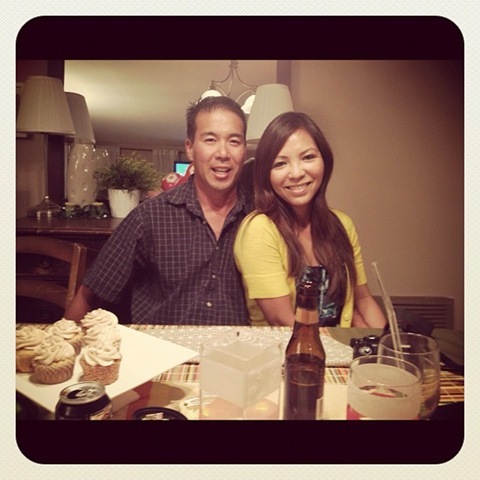 We had a great day spending time with our family and friends . 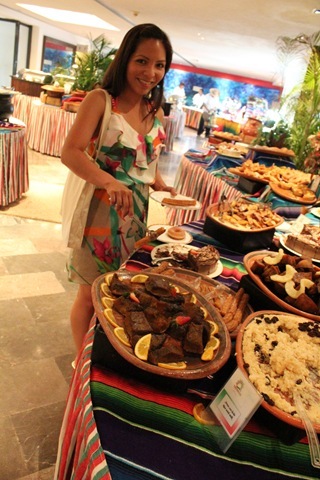 It was a great way to go back in time and reminisce thru the tropical flavors and taste of Puerto Vallarta. Thank you to Foodbuzz for choosing me for May’s Foodbuzz 24 x 24. What is 24×24? It is when 24 Featured Publishers are selected by FoodBuzz team and we have 24 hours to post an unforgettable meal. happy anniversary! looks like an outstanding meal – congrats on being selected for foodbuzz 24×24 too! Happy Anniversary! OMG. 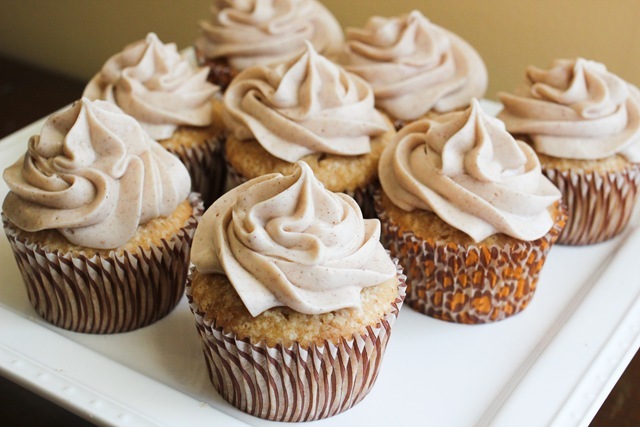 Churro cupcakes? *jaw drops* Amazing. 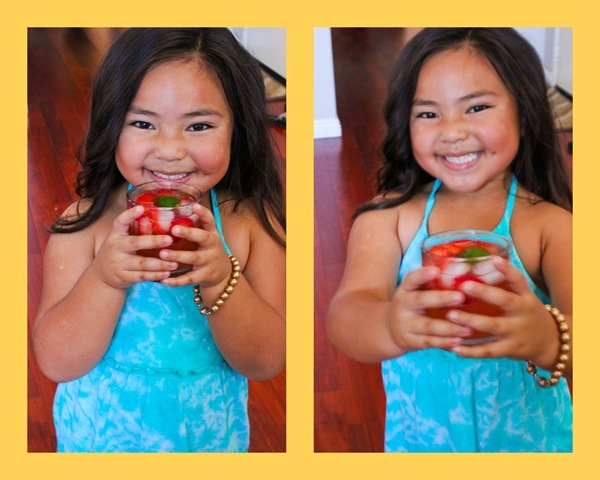 Also — that’s it — Jazzy needs to be in a Gap ad or something! That girl is way too adorable. That meal is amazing! The table is gorgeous and the food (and cupcakes) all sound wonderful! Congratulations!!! 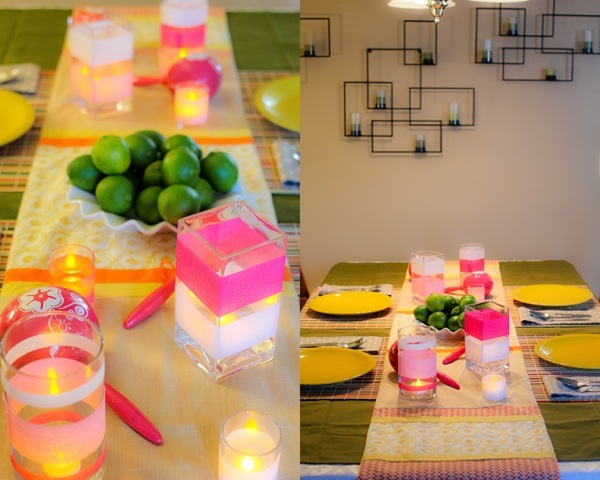 Your menu is awesome, and the fun colors for the table are so stinken cute! The food looks delicious, and the setting is gorgeous! I want to be there right now!